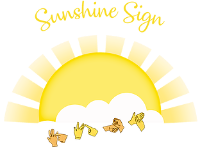 Sunshine Sign began trading in January 2013. The baby and toddler classes have proven to be very popular in Teesside and County Durham. A friendly and fun enviroment for children to develop and learn a lifelong skill. They have worked closely with Speech and Language Therapists sharing ideas and strategies to enhance early communication in babies and children. They also deliver Adult courses too! Offering British Sign Language (BSL) Level 1 and Level 2 which are national qualifications written by Signature Durham. The courses are delivered by highly qualified deaf tutors.